This video dives a bit deeper into monitoring networks. First, we’ll go over how to monitor a modern network, some tips and tricks to help avoid gotchas. For instance, ever wonder why you can’t see other computers traffic on your network switch? yeah, we talk about that! We eventually work our way towards using tcpdump. We’ll monitor live traffic and then store it to disk. Lots of content in here, so let’s get started! Short post today, but, I’m SUPER excited.. I have TWO CISOs lined up to start the podcast series! Lots of you will know who they are, and you’ll be hearing from them REALLY soon. We’ll be talking about technology. Not super theoretical definitions that CISOs know, but, we’ll talk about real tactics on how to leverage technology to keep your organizations safe. What would you ask an industry famous CISO? I had a conversation this morning, where I just (maybe I’m slow) realized how Apache Kafka has inverted the responsibility in the world of message passing. The challenges were typical for traditional enterprise software. Scaling was a mess and licenses could be cost prohibitive to scale. This meant lower adoption and general loss of the advantages for smaller projects or customers. Now let’s take a look at Apache Kafka. Ok, that’s a lot of arrows, and lines and block, oh my. BUT, The thing to notice here that’s SUPER important, is that they’re all outside the Kafka box. Kafka isn’t smart. In fact, Kafka was designed to be dumb. There is no message routing, there’s no message format changes, nothing. The big box in the middle is dumb. It scales really well, and stays dumb. In fact, the only ‘type’ of communication that Kafka has is publish/subscribe. One(to-many) clients produce messages to a topic. They send in data. Doesn’t matter if it’s JSON, XML, yiddish, etc. It goes to the topic. Kafka batches them up, and ‘persists’ them as a log file. That’s it. A big old data file on disk. The smarts of Kafka comes next… One Consumer Group (which may be MANY actual instances of software, but with the same group ID) subscribe to a topic… or more than one topic. Kafka (Zookeeper help) remembers which client in the client group has seen which block of messages. Ok, that sounds confusing. I’ll try again. 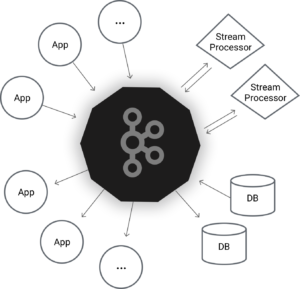 Kafka coordinates which blocks of data get to which client. If the clients are in the same client group, then data is only sent out once to a member of the client group. More than one client group can subscribe to a topic, so you can have multiple consumer processes for each topic. Now, instead of the message bus sending messages from one function to another, that work is left up to the clients. For instance, let’s say you have to ingest an email from a mail server and test it to see if there’s a malicious reply-to address. First, the message comes in as plain text to the ‘email_ingest‘ topic. This can be published to by many clients reading data from many servers. Let’s assume Logstash. Logstash will send the message in as plain text. After the message is in the ‘email_ingest‘ topic, another program will transform that message to JSON. This program subscribes to ‘email_ingest‘, pulls each message, transforms to JSON, and publishes it back to another topic ‘email_jsonified‘. The last piece of the puzzle is the code that calls the email hygiene function. This piece of code takes the longest, due to calling an external API, so needs to scale horizontally the most. This function reads from ‘email_jsonified‘, calls the external API, and if there’s a malicious IP or reply-to detected, publishes the message on the last topic ’email_alert’. ‘email_alert‘ is subscribed to by another Logstash instance, to push the message into Elasticsearch for visualization in Kibana. The big difference here, is that the intelligence moved into the clients. The clients need to handle the orchestration, error handling, reporting, etc. That has some pros and cons. It’s great that clients can now be written in many technologies, and there is more ‘freedom’ for a development group to do their own thing in a language or framework they’re best suited for. That can also be bad. Errors add a new challenge. Dead letter queues can be a pain to manage, but, again, it puts the onus on the client organization (in the case of a distributed set of teams) to handle their own errors. Kafka scales horizontally on a small footprint really easily. It’s mostly a network IO bound system, instead of a CPU or memory bound system. It’s important to keep an eye on disk space, memory and CPU, but they tend not to be an issue if you set up your retention policies in an environment appropriate manner. Getting back to a technical topic, let’s talk about PCAP. Is an abbreviation for Packet Capture. PCAP is the industry standard format for capturing, storing and analyzing network data. PCAP was made ubiquitous thanks to ‘libpcap‘, a pretty common *nix library for network monitoring and manipulation. libpcap is enabled via some super simple (to use) tools called tcpdump and tcpreplay. These allow a developer/analyst to work with the data, over real or virtual networks. Those tools are command linux utilities for experts to use primarily, but they’re simple to get started with. Alternatively, you can use a tool called Wireshark to monitor, capture and analyze network traffic. Wireshark is free, and has some great features around session decoding, traffic analysis and filtering. Without jumping into too much detail in this post (more information can be found in the video below), we’ll go over some high level information about what a packet looks like. A packet is a chunk of data, sent across a network. A packet can contain a full message, or can be one component of a much larger stream, that’s used to break up large pieces of data (movies, songs, pictures, etc) into bite sized chunks. A packet contains a header, which tells the network gear things like source and destination address, timestamp, protocol and packet size. 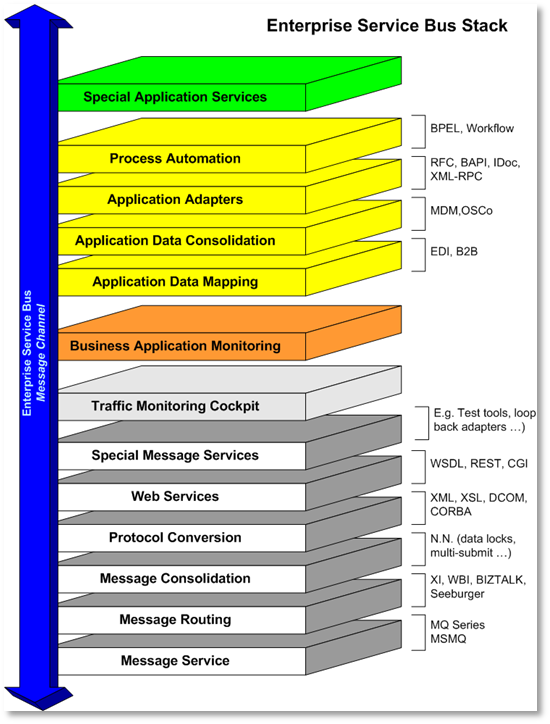 Network data can be classified in different layers, reference the OSI Model. Each layer up from the ‘physical’ layer can be thought of as more specialized. An example of that would be an HTTP (layer 7) packet, contained in a TCP packet (Layer 4) within an IP packet (layer 3) which is contained in an Ethernet (layer 2) packet. The ethernet packet has very little information in the header. Source, destination and what protocol the next/layer 3 packet it. The address in the ethernet packet is a physical/hardware address. An IP packet is potentially a globally reachable packet ( 8.8.8.8 ) and the TCP packet adds application ports. Calling all Cybersecurity Technical folks! Over the next time period, I’m planning on putting together some interviews in podcast format between me and some security folks that I know. I also to meet some new ones in the process! There are tons of security podcasts and interviews with security folks. Most seem to be covering current events, outages, new threats, etc. My goal is to bring focus on the technology that we use in the security landscape to fix things, but to also talk about some best practices when it comes to creating new tools and applications. Know anyone I should talk to?